Just before lunch on Friday, I was informed that one of our partners and a lady who had a passion for France and all things French had passed away. I was on a plane a few hours later for Minneapolis, MN for the Memorial services were being held on Saturday morning. Isn't it awesome that I had a NWA voucher that was going to expire in one week. It made a very expensive last minute trip a lot less expensive. Her name is Sally Brallier. Occasionally I go to a funeral or memorial service and I see a person whose life touched so many people in such a positive way. Sally was that kind of person. It was difficult for me to hold back my tears as I heard stories about her. I want to be remembered that way when people come to my funeral, but I know that will take some work in my life. 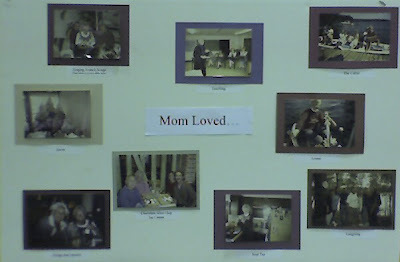 I heard people talk about how she loved, and shared and encouraged and taught. I heard a niece talk a for about 10 minutes just listing the one liners that Sally had taught her like always smile, always keep gum in your purse, and your students will respect your discipline if they know that you care about them. I heard a pastor say that she had a "yes face" as described in one of Swindal's books. I realized that she exemplified so much of the difference between good churches and great churches. She sought to touch lives and was not concerned with being important. Sounds a lot like Jesus. She has some great, grown children who are the product of a parent whose life made a difference. Her husband Marlin is a lucky man to have his shared life with her. Of course, he is a pretty great guy himself. He must be because she chose him. Marlin asked me to bring some new magazines with the French article to give to those attending the memorial because France was such an important part of Sally's life. I am so glad I was able to be there to learn more about this special lady.